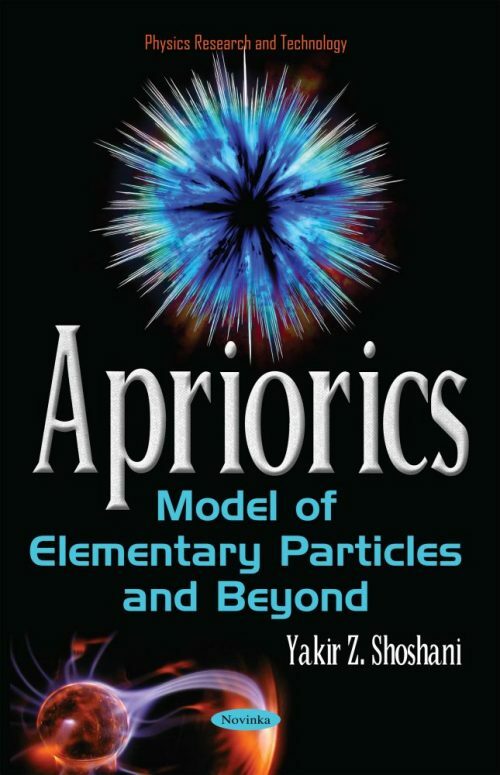 “It has been a great pleasure for me to review the excellent book of Yakir Shoshani entitled Apriorics: Model of Elementary Particles and Beyond. Apriorics is the only approach that exists to date to my knowledge that is able to predict the number of elementary fermion and bosons that are described by the standard model. Moreover, it is the only axiomatic approach that is able to explain the dimensionality of space-time. Another benefit of Apriorics is an explanation of an expanding space-time. All those results are derived from five axioms describing the allowed ways to connect nodes of a graph. The nodes are denoted “fundamental entities” and the graph is denoted “ontological structure”. The approach does not include adjusting any free parameters. In this framework one is able to understand the notion of “existence” of either an event or a particle in a unified way. The philosophical motivation behind the axioms is that every entity can only be described in terms of its connection to other entities as the only meaning one can ascribe to a part is its relation to the whole. Another important concept is abstracted from the standard model that is that “interaction” between two nodes can only occur by a third node. (Every interaction between two particles is a result of a “gauge” boson particle). The above important results do not imply that the work is completed. Many notions which are parts of theoretical physics such as metric or field are not defined in the book. There is neither an explanation of how one should calculate the parameters of the standard model of elementary particles or of cosmology including the elementary particles masses. Another notion that is missing is the “sub ontological structure” that is a sub set of nodes of an ontological structure that is itself an ontological structure. Such a notion would help us to understand regardless of the ontological structure that is our reality why the smallest things that we can detect are the perceived elementary particles. Aquinas, T. (1946). Saint Summa Theologica. 3 volumes. Trans. The Fathers of the English Dominican Province. Benziger Brothers: New York. Ballentine L. E. (1973) Can the Statistical Postulate of Quantum Theory be Derived? A critique of the Many Universes Interpretation. Found. of Phys.. 3(2). pp. 229-240. Bender J. W. (Ed.) (1989) The Current State of the Coherence Theory. Kluwer, Boston. Berkeley G. (2005) A Treatise Concerning the Principles of Human Knowledge. Cosimo Inc., New York, N.Y.
Bovens, L. and Disson, E. J. (2000) Coherentism, Reliability and Bayesian Networks. Mind 109, issue 436. pp. 685-719. Cohen, M.R. (2015) A Preface to Logic. Dover Publications Inc., New York. Cremmer, E. et. al. (1978) Supergravity Theory in Eleven-Dimensions. Phys. Lett.. B76. pp. 409-412. Davidson, D. (1984) Inquiries into Truth and Interpretation. Oxford University Press. Davis, P. (1984) God and the New Physics. Simon and Schuster, New York. Descartes, R. (2010) Meditations on First Philosophy. Pacific Publishing Studio, USA. Dewitt, B. S. and Graham, N. (Eds.) (1973) The Many Worlds Interpretation of Quantum Physics. Princeton University Press, Princeton, NJ. Earman, J. (1989) World Enough and Space-Time. Absolute versus Relational Theories of Space and Time. MIT Press, Cambridge, MA. Everett, H. (1957) Relative State Formulation of Quantum Mechanics. Rev. of Modern Physics. 29, pp. 454-462. Freeman, J. A. and Skapura, D. M. (1992) Neural Networks: Algorithms, Applications and Programming. Addison Wesley Publications, New York. Friedman, M. (1983) Foundations of Space Time Theories: Relativistic Physics and Philosophy of Science. Princeton University Press, Princeton, NJ. French, S. and Ladyman, J. (2011) In Defense of Ontic Structural Realism. Chapter 2 in: Scientific Structures. Edited by: P. Bokulich and A. Bokulich. Springer, Netherland. Frith, C. D. et. al. (1991) A PET Study of Word Finding. Neuropsychologia. 29 (12). pp. 1137-1148. Greenberger, D. M. (1983) The Neutron Interferometer as a Device for Illustrating the Strange Behavior of Quantum Systems. Rev. of Mod. Phys.. 55. pp. 875-906. Gross, D. J. et. al. (1985) Heterotic String. Phys. Rev. Lett.. 54(6). pp. 502-506. Grunbaum, A. (1973) Philosophical Problems of Space and Time. Reidel Publishing Co., Boston. Hawking, S. and Penrose, R. (1996) The Nature of Space and Time. Princeton University Press, Princeton, NJ. Healey, R. A. (1984) How Many Worlds? Nous. 18 (4). pp 591-616. Hebb, D. (2005) The Organization of Behavior: A Neuropsychological Theory. Lawrence Erlbaum Associates, NJ. Huard, R. (2007) Plato’s Political Philosophy: The Cave. Algora Publishing. New York. Hume, D. (2012) A treatise of Human Nature. Dover Philosophical Classics. Mineola, N.Y.
Jennings, R. (1989) Scientific Quasi-Realism. Mind. 98(390). pp. 225-245. Kant, I. (1998) Critique of Pure Reason. Translated and Edited by: Paul Guyer and A. W. Wood. Cambridge University Press, New York. Kantorovich, A. (2009) Ontic Structuralism and the Symmetries of Particle Physics. J. for General Philosophy of Science. 40(1). pp. 73-84. Kurzweil, R. (1999) The Age of Spiritual Machines. Penguin Books, New York. Leibniz, G. W. (1989) Philosophical papers and Letters. Kluwer Academic Publishers. Dordrecht, The Netherlands. Lewis, D. (1986) On the Plurality of Worlds. Oxford University Press, New York. Linde, A. (1994) The Self Reproducing Inflationary Universe. Sc. Amer. 241(5). pp. 32. Loewer, B. and Schaffer, J (Eds.). (2015) A companion to David Lewis. Wiley - Blackwell, USA. Peterson, S. E. et. al. (1988) Positron Emission Tomographic Studies of the Cortical Anatomy of Single Word Processing. Nature. 331. pp. 585-589. Platinga, A. (1967) God and Other Minds. Cornell University Press. Ithaca, New York. Poeppel, D. (1996) A Critical Review of PET Studies in Phonological Processing. Brain and Language. 55(3). P.317-351. Psillos, S. (2001) Is Structural Realism Possible? Phil. of Sc. Supplement. 68(3). pp. S13-S24. Putnam, H. (1979) Mathematics, Matter and Logic, Vol. 3: Realism and Reason. Cambridge University Press. Quine, W.V. (1951) Main Trends in Recent Philosophy: Two Dogmas of Empiricism. Philosophical Review. 60(1). pp 20-43. Reichenbach, H. (1957) The Philosophy of Space and Time. Translated by M. Reichenbach and J. Freud. Dover, New York. Rubenstein, M. J. (2014) Worlds Without End: The Many Lives of the Multiverse. Columbia University Press, New York. Russell, B. (2008) The Problems of Philosophy. Wilder Publications. Radford Va., USA. Shoshani, Y. (1989) Introduction to Formal Ontology. In: Philosophy of the Natural Sciences. Editors: V.H.P. Tempsky. Vienna. pp. 202-209. --- (1991) Philosophical Origin of Quarks. Physics Essays. 4(4), pp. 566-576. --- (1998) Apriorics and the Proliferation of Elementary Particles in Non-Interacting Universes. Physics Essays. 11(4). pp. 512-520. --- (2010) Apriorics and a New Meaning of Space and Time. Physics Essays. 23(2). pp. 285-292. --- (2014) The Emergence and Potential of Apriorics. Physics Essays. 27(1). pp. 126-130. Skyrms, B. (1976) Possible Worlds, Physics and Metaphysics. Phil. Studies. 30(5). pp. 323-332. Swinburne, R. (1979) The Existence of God. Oxford University Press. Van Fraassen, B. C. (2008) Scientific Representation: Paradoxes of Perspective. Oxford University Press. Wesson, P. S. (1999) Space-Time-Matter: Modern Kaluza-Klein Theory. World Scientific, New Jersey. Woodbridge, F. J. (1965) Nature and Mind: Selected Essays. Russell and Russell, USA. Worrall, J. (1989) Structural Realism: The Best of Both worlds? Dialectica. 43(1-2), pp. 99-124. Yahalom, A. (2008) The Geometrical Meaning of Time, Foundations of Physics. 38(6). pp489-497. Young, J. (1991) Truth, Coherence and the Vienna Circle. Synthese. 86. pp. 467-482. Zizzi, P. A. (2001) The Early Universe as a Quantum Growing Network. arXiv preprint gr-qc/0103002. (Proc. IQSA Fifth Conference. Cesena. Italy). This book is mainly designed for researchers, including graduate students interested in the philosophical aspects of physics. However, owing to the simplified presentation of the concepts, ideas and framework of the suggested theory, it may also expand the horizons of undergraduate students in physics, mathematics and philosophy, and teachers of these fields as well in high schools and colleges.